Uptown Charlotte (or Center City Charlotte as many call it) is one of the fastest growing areas for business and residents are attracted here with housing choices of lofts, condos, apartments and single-family homes. 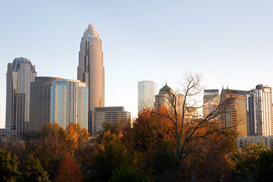 Charlotte is one of the nation’s largest financial/banking centers. Light Rail, public transportation, restaurants, convention center, bars, and trendy art galleries are all walking distance of one another in Center City. If you want sports – Carolinas Panther Stadium for NFL football, Bobcats arena for NBA basketball and the NASCAR Hall of Fame for racing fans in 2010.